Watch this commercial for a brand new, state of the art RCA Television with a… you guessed it – a remote control! After listening to the announcer explain how it works, I don’t feel nearly as bad explaining our universal remote control and how it powers the HTPC when the mother-in-law is visiting. Wow, that really was an impressive TV set for 1961 wasn’t it? We're getting back to that old saying, "there's no such thing as a free lunch" with news today of Hulu's possible plans to charge for at least some of their content. So one of the biggest advantages (and reasons for putting up with poorer quality than broadcast/cable) just might be going away. "he envisions a future where at least some of the TV shows and movies on Hulu, the premium video site co-owned by News Corp., NBC Universal and Disney, are available only to subscribers." If this is in fact the direction Hulu is going, it definitely would put a dent on the number of people interested in Hulu. The exception to this might be if they really are considering putting Hulu on a set-top box or other CE devices. Dave Zatz at ZatzNotFunny noticed an article that said Vudu might be getting Hulu on their media player and there have been several rumors about XBox Live getting Hulu on the XBox 360. I can see a paid model being more palatable to the owners of Hulu than the current free for all model. I kind of hope this isn't true, but it probably is the future. Newspapers, TV and other media online is very likely moving towards more paid or at least subscription models going forward and this goes along with that trend. Put Hulu in HDTV or at least much closer-to-HDTV quality, put it on as many CE boxes as possible like Netflix has been doing and I think it just might work. MediaPortal, one of the more popular open-source and free HTPC software programs is preparing to release the 1.1.0 (alpha) version of MediaPortal 1. This alpha version is a work in progress (they've labeled it "for testing only") that will move MediaPortal 1 towards a December 2009 final release version. Many changes will be included and it should "shore-up" this version of MediaPortal that we've all come to know. The bigger news is that with this final work being completed on MediaPortal 1 this year, the focus for developers moves to MediaPortal 2, the next generation of MediaPortal. So far, MediaPortal 2 has been developed with a small group of the MediaPortal team so the new focus on MediaPortal 2 means more developers involved and faster progress towards a new HTPC software. Current estimates are for MediaPortal 2 to take another year or more of development so the sooner they focus on it the better. The good news there is they plan to begin releasing public "test" versions of MediaPortal 2 so everyone can get a feel for what it will look like. 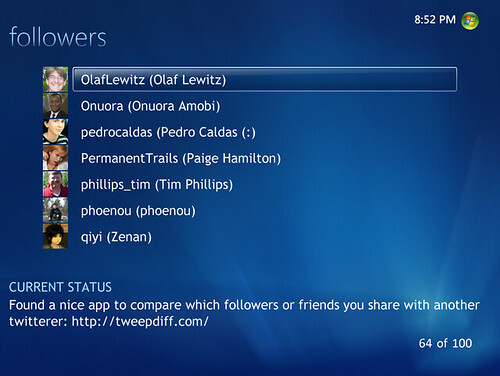 If you're a Snapstream Beyond TV user and are tired of the same old menu icons, a nice set of replacement icons is available for download on the forums. 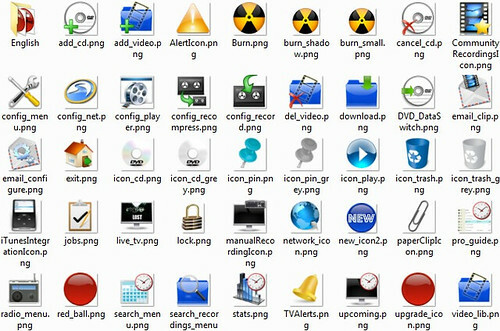 There is a 4:3 and 16:9 version of the icon set for download. Another 1TB Hard Drive deal is up today at ZipZoomFly (affiliate). This one has an instant rebate that brings the price to $74.59 with free shipping! For more tech deals with a flare towards media-tech check out GeekTonicDeals! Summer has arrived and May, just like the months before it flew by here at GeekTonic. GeekTonic continued on a steady path of HTPC and media-tech goodness. Thanks to you, the readers for reading - I will continue working hard to bring you the content you came here for! 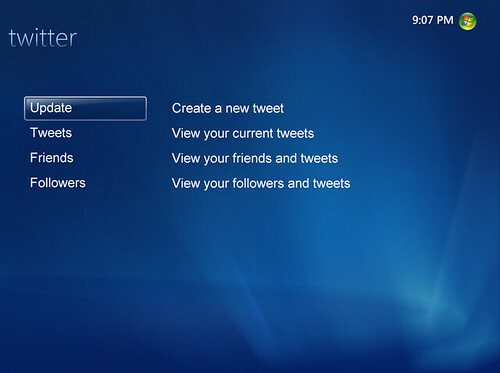 TwitterMCE puts twitter in you Media Center. With the new TwitterMCE app you can post tweets, view friends, followers and timelines within Media Center. The beta program is a MCML program and works on: Microsoft Windows Vista Premium, Microsoft Windows Vista Ultimate or Microsoft Windows 7 Media Center. 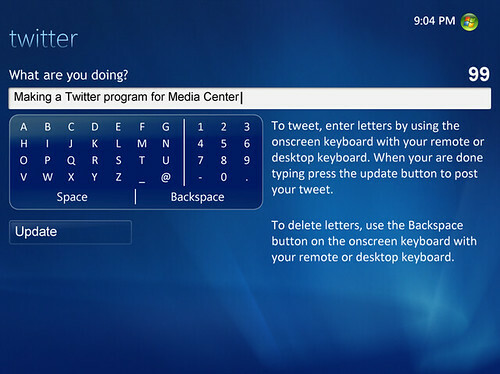 You'll probably want a decent MediaCenter keyboard if you do much "tweeting" from MediaCenter, but the app looks nice and worth a try for all of you twitter addicts. Google just stuck their other foot in the eBook water. Depending on how they proceed, it could be good or bad for consumers - particularly current eBook consumers. Google showed their intentions to begin a program enabling book publishers to sell eBook versions of their books directly to eBook readers through google at the annual BookExpo convention this past weekend. In the "good" category, the addition of Google to eBooks should mean more books available to eBooks. 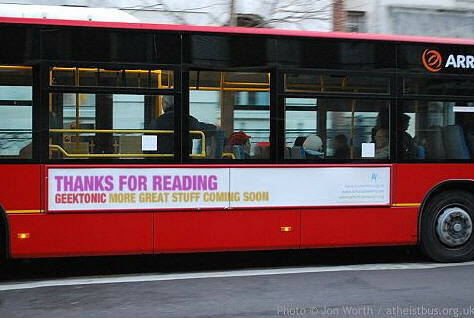 And it very likely will mean more eBook readers will arrive providing competition on the hardware side of things. Google plans to allow access to any device with Internet access, including mobile phones and other devices. The possible "bad" from Google's entry comes mostly from the wider range Google will allow publishers to price their books for. Amazon locks the initial "best seller" list at a fixed price of $9.99 and Google's pressure very likely could push Amazon to shy away from that policy. Also, the multiple formats we're likely to see puts the eBook readers in the position of only having access to "Kindle-format" books or "Google-Format" books. Much like you had with digital music with different drm'd music, the incompatible formats create their own problems. Bottom line though, it should be a net positive to have a company such as Google get in the game. More eBooks available in more places should help eBooks hit the mainstream and lower eBook reader prices. I don't see Google selling their own eBook device, but I guess you never know - how about a version of the Plastic Logic eBook concept? Watching this demo of the Plastic Logic thin-film eBook Reader, I see this form factor as the future of eBook Readers. I’m not sure how well it would compete today versus other eBook readers on the market including the Kindle 2 and Kindle 3, but I think the super thin, paper-like form factor is just the thing to help increase eBook Reader adoption – that along with major price reductions. 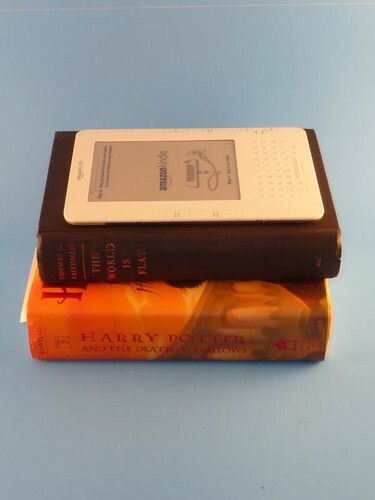 I can see an eBook reader with this super-thin, flexible form factor really making newspaper reading and magazine reading more palatable on an eBook Reader – especially if you throw in full color and easy touch-screen navigation. The question is who will be the first to bring this sort of technology for eBook readers to consumers? The real battle with eBook readers is near. Amazon has made significant progress with the Kindle brand. Someone like Google, Apple or Microsoft could push the envelop further and with competition and innovation bring eBooks into the mainstream. 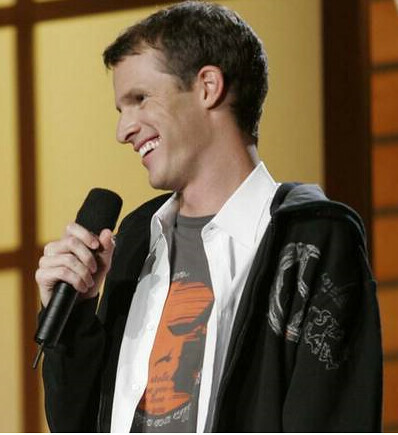 This weeks list of premiering summer TV shows includes the NBA Finals, Royal Pains, Tosh.0, Whale Wars and more. Read on for all of the details. MTV Movie Awards (9pm on MTV) - Andy Samberg hosts the MTV Movie awards. Jesse James is a Dead Man (10pm on SpikeTV) - Series Premiere on Spike. What we have here is the husband of Sandra Bullock, Jesse James (also host of "Monster Garage") taking on new challenges and racing the "pseudo-clock countdown". This one is actually sort of interesting to me although I'm not sure I'll invest in another realityTV concept show. I'm a Celebrity...Get Me Out of Here! (8pm on NBC) - Series Premiere of another reality TV show. This one hosted by Damien Fahey and Myleene Klass puts celebrities (that could be a stretch I know) in challenges that test their survival skills. The Tonight Show with Conan O'Brien (10pm on NBC- Available in HD) - Conan O'Brien takes over for Jay as the host of the Tonight Show. I'm guessing Conan will make a splash this first week. Man vs. Wild: Will Ferrell Special (10pm on Discovery- Available in HD) - I never expected to see Will Ferrell in an Adventure/Travel series but sure enough he is. Here we have Will Ferrell dropped into the Arctic Circle with Bear. The two must brave the elements for 48 hours. Man Land (11pm on HGTV- Available in HD) - Series Premiere of a male-focused home/room design show. The Listener (10pm on NBC- Available in HD) - A paramedic with paranormal powers. Think "The Pretender" meets "True Blood". Royal Pains (10pm on USA- Available in HD) - a 75 minute premiere where a fired NYC doctor ends up in the Hamptons doing house calls to the uber-rich. I'm going to be recording these just out of curiousity - could be watchable like Burn Notice is. Ghost Adventures (9pm on Travel- Available in HD) - a "travel" show searching for ghosts. Whale Wars (10pm on Animal- Available in HD) - The sea conservation society goes to extreme lengths to rid the world of whaling operations. Mr. Prince (10pm on Ovation) - Hal Prince, producer of "The Phantom of the Opera", "Cabaret," and "West Side Story" is profiled with a tribute to him as well.